WASHINGTON (CNS) — Finding candidates to consider joining the priesthood or religious life has never been easy. There are serious questions to address, prayer to undertake, and solo and group activities that help determine whether a person is meant to live a religious life of ministry. To meet the ongoing need for priests and women religious to meet the spiritual needs of Catholic communities, various programs have evolved over time to give men and women a wide range of discernment opportunities. In the end, it comes down building relationships, trust and understanding. On the spiritual side, the desire to enter religious life is grounded in a deep love of God that is built through prayer and a desire to take on the “smell of the sheep,” as Pope Francis has demonstrated time and again. Here’s a look at the way a few organizations operate their vocations programs. Innovative? Perhaps. More so they seem to be common sense steps that are reaping rewards. At Texas A&M University in College Station, Texas, the Catholic community is larger than the majority of parishes in the country. About 25 percent of the 60,000 students on campus identify themselves as Catholic, said Marcel LeJeune, associate director of Newman Campus Ministry at St. Mary’s Catholic Center, which serves the school. That breaks down to about 15,000 young adults around which to build ministry. All of these are signs of what LeJeune describes as a dynamic ministry “to all the different kinds of kids you’re going to meet.” Such vibrancy has long borne fruit for vocations in religious life. “We have 160 Aggie Catholics who are bishops, priests, deacons and religious,” LeJeune explained, invoking the school’s sports nickname. — In mid-October, 81 university alumni were in formation for religious life or enrolled in a seminary. — This year alone, 15 men and women entered formation programs. 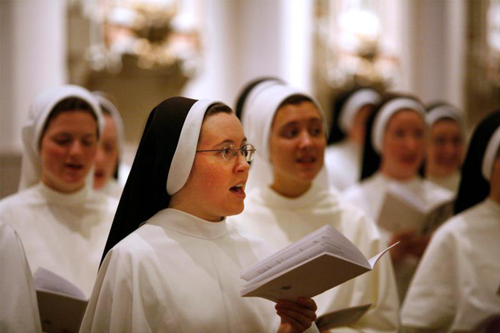 — Over the past 19 years, more than nine men and women annually entered religious life; over the past five years, the average number has risen to more than 12. LeJeune credits the large Catholic population for such glowing statistics: the more people, the greater the number of vocations. Further, he finds that such vocations success has more to do with the enthusiasm of the 65 people, including the priests and women religious, who work at St. Mary’s. “We don’t have a magic bullet,” he said. “For us, it’s men and women who love what they do and who are meeting students who can see these men and women, a priest, a religious, who love what they do, and can see themselves doing it. The vibrancy of the St. Mary’s Catholic Center apparently has gained the attention of the Diocese of Austin, Texas, and even Vatican officials. The last two pastors of the community have been named bishops. There’s Bishop Dave A. Konderla of Tulsa, Oklahoma, who served for 11 years at St. Mary’s, and his predecessor, Bishop Michael J. Sis of San Angelo, Texas, who served for 13 years there. In a few years, Msgr. Scott Friend, director of vocations in the Diocese of Little Rock, Arkansas, sees the number of priests bumping up from the mid-50s to the mid-60s. That may not seem like a large number of priests, but in a state where Catholics are a definite minority, a boost of nearly 20 percent looks good. Msgr. 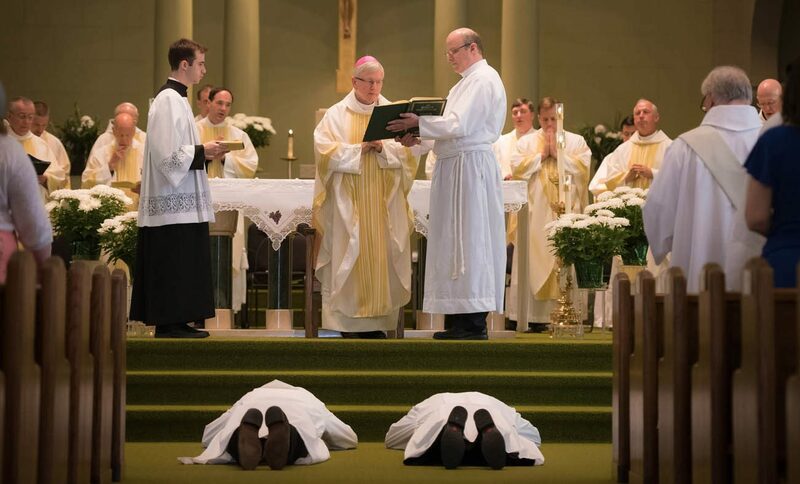 Friend, who also is the diocese’s vicar general, saw five men ordained to the priesthood in May. For next spring, six men are on course for ordination. And in 2018, the number is seven. “That’s pretty phenomenal. We’ve got some pretty sharp guys coming up,” he told CNS. Current seminarians and new priests represent a mix of men from different age groups. Along with young men who entered the seminary from high school, there’s a number of men who began careers before discerning a call to serve God. Several factors have contributed to the diocese’s success. One is the ability of staff, especially the four priests on the team, to help seminarians navigate the road to priesthood. “One of the mistakes by a lot of dioceses is they get a vocations director who is young, who’s just been ordained a few years. There’s a problem: You’re still trying to determine who you are as a priest and you’re raising questions and some of the questions you get are challenging,” he explained. “You’re really fathering guys to the priesthood or where the Lord’s leading them because sometimes it’s not the priesthood,” the priest said. Other factors also have contributed to the diocese’s growing vocations numbers. About a dozen seminarians live in what is known as Formation House, a community located at a Little Rock parish in one of the city’s working-class neighborhoods. There, seminarians not only go through the experience of book learning, but see the potential for parish ministry. He said that the setting allows the men to widen their “missionary spirit” in a state where just 4 percent of the population is Catholic. Like many areas of the country, Arkansas is experiencing a growth in the Latino population. Seminarians are required to learn Spanish. Having a language skill builds a bond to a community that priests might not get to know well, Msgr. Friend said. And the Latino community is beginning to produce candidates for priestly vocations as well. It’s a good sign, Msgr. Friend acknowledged. A culture of vocations finds parishioners throughout the Diocese of Wichita, Kansas, promoting the priesthood and religious life. It’s something that has been fostered in the 25 counties of the diocese for 30 years, said Father Michael M. Simone, diocesan director of vocations. There has been “profound impact on our families and schools and has a strong effect on our vocations programs,” Father Simone told CNS. The effort has helped boost the number of seminarians to more than 60 in recent years after it hovered about 33 percent lower a decade ago. One result is that median age of diocesan priests has remained constant at 45 to 47. “In terms of recruiting the next generation of priests, it really starts in the family and expands to the family receiving the faith which is the parish and the school,” he explained. Diocesan schools play a role in the vocations culture as well. “There’s a lot of preformation and cultivation for the calls to discernment to take place for us,” Father Simone added. The seminarians also are prepared to minister to the growing Latino population of the diocese, something which other dioceses may not be addressing yet. The effort includes training in the Spanish language as a way to stress the global nature of the church. “We have a lot of Hispanic people who desire and need bilingual priests,” he said.